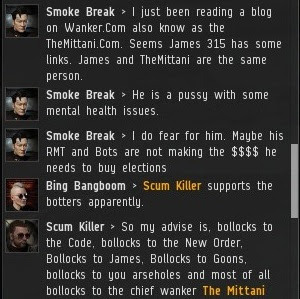 In honour of the first anniversary of the New Order, we're counting down the top 15 MinerBumping posts. Click here for #15-#11. #10. "New Carebear-Led Resistance Movement Struggles to Gain Support"
Remember the "Proveldtariat"? If you're new you probably don't, which should give you a hint as to its effectiveness and staying power. But of all the anti-Order resistance movements, it may have been my favorite. Founded by concerned forum poster Anslo, the Proveldtariat movement was the first rebel organization with its own blog. But Anslo soon discovered that it's far more difficult to rally a bunch of misfit underdogs into a disciplined fighting force than a Disney sports movie might suggest--especially if the miners are AFK. #9. "Sins of a Solar Spymaster, Part 2"
I love it when the enemies of the New Order do something that surprises me. When I convo'ed a self-proclaimed spy and asked him what his intentions were, Ledrian Saisima's explanation provided one of the most extraordinary "out of left field" moments of all time. Emergent gameplay is what makes EVE great, even when people are really bad at it. You know you're in for a treat when a corporation's description consists entirely of an angry rant about the New Order. To The Stars corporation did not disappoint. The two-parter offered some good ol' fashioned MinerBumping meat and potatoes: Tears, senseless profanity, threats of revenge, and conspiracy theories. #7. "Mad Moon Rising, Part 1"
What can you say about Moonsong Miner? She was a truly unique presence in the highsec ice fields. If MinerBumping were a reality show, this post would be our introduction to "America's Sweetheart". Her strange blend of rage and softness, mixed in with poetically-broken English, charmed us all. As any '80s sitcom will attest, misunderstandings between people can lead to wonderful comedic moments. 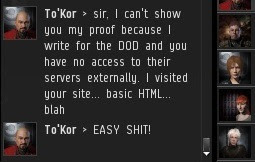 To'Kor flew into a rage after I bumped him and proclaimed the superiority of my Code. You see, To'Kor is a programmer for the U.S. Department of Defense, and he believes his own coding skills cannot be matched. I only wish every carebear worked for an IT department, because I love seeing how many of them think it impresses people. Luckily, we got a chance to follow-up with To'Kor weeks later, when I bumped into him in another system. She's busy fighting the giant robots that attack Seoul, South Korea. the only time minerbumping made me sad rather than happy was moonsong being ganked :(. Moonsong's english was prehaps the greatest heights this language ever reached far surpassing the greatest poets. 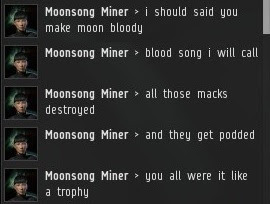 Reading about Moonsong Miner again brought a tear to my eye. I say let's take some time from the celebrations of the New Order's birthday to sing a song to a moon. 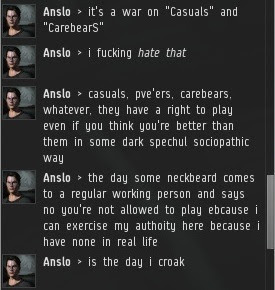 These days, Anslo hangs out in the Galactic Summit RP in-game chat and EvE forum. He wasn't mounting an effective resistance ... he was role-playing a resistance person. Was he roleplaying an hopeless resistance fighter who fails to inspire anyone else? Or maybe he was roleplaying the movie villain who oppose law and order and is therefore doomed to fail? 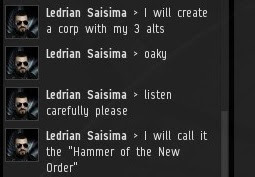 I think "Codification" was one of the first posts I read here, months before I even started playing Eve. I wish there was a way to relive the historic posts as if it was for the first time. But there isn't short of heavy illegal drug usage, so instead I'll be hitting the historic posts all day this Sunday. I don't know why but this is the only site I read that actually makes me want to log in and play Eve...in Empire space. Reading codification just now was my first experience of semantic satiation. God that felt weird.